In order to promote the flow of soothing energies, starting October 1st all TIGS folk are wholly encouraged to consider taking part in The Wholesome Competition. Less of a bloody-toothed competition between gladiatorial rivals and more of a friendly environment to tinker away merrily on a small project with pals. A call to jolly cooperation, and all that entails. Merely post your project’s thread in the specially appointed forum after reading the rules linked above, and find yourself immediately at ease with those alongside you, striving to create a simple and nourishing treat for the world via game development. 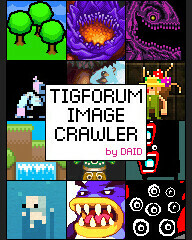 If you are not a member of the TIGSource forums, then now is the grandest time of all to join; when Summer-time passions are calmed and an air of Autumn friendliness jostles the leaves from their homes and onto colorful new adventures. Be amongst them and be swept up this month with all of us that are certain to be your new friends. Welcome. And for those of you aware of how long it has been: Welcome back.